Color(s): White with markings of any color. After the crossing of two breeds Papillon and Poodle, Papoo was created, it is what is known as a mixed breed or designer dog. 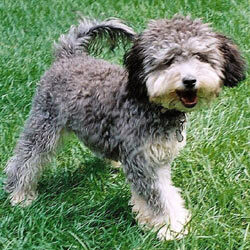 This dog breed is known to be lively, bold, and hardy. The Papoo is lovable, loving and faithful. They do not do well if they don’t have a family. They can be destructive if they are bored. The are very good with older, considerate children. They are not advisable to raise with other dogs but will do okay with non-canine pets they have been raised with. This dog breed is skeptic of strangers and alert family by making sounds about visitors. The coat of the Papoo may be long and silky, long and slightly wavy, or very curly. Early socialization and obedience training is recommended. They don’t like harsh training. It should be firm, patient, and consistent otherwise they do not respond. They like apartment life. Bathing should be done when necessary using a mild shampoo. Like other dog breeds the papoo has health issues and dog diseases it is the owner's responsibility to keep an eye on the health and comfort of their pet. Dental hygiene is important in this dog breed to prevent early tooth loss.The Papoo may be prone to such health issues and dog disease as PRA, ear infections, anemia, skin problems, luxating patella, and sensitivity to anesthesia.